I called Moe from work yesterday afternoon and had him pull a container of prawns out of the freezer. Spotted prawns are unique to the west coast and the season is a very short one, just 6 weeks or so long. Spotted Prawns are a favourite of mine. 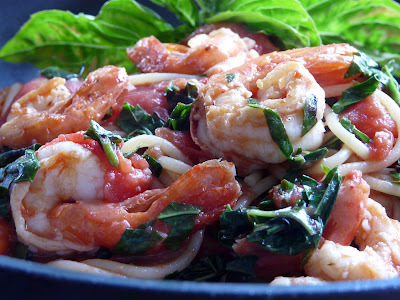 I don't like shrimp at all,but I love these prawns. Sweet and tender. Dinner was quick to put together. 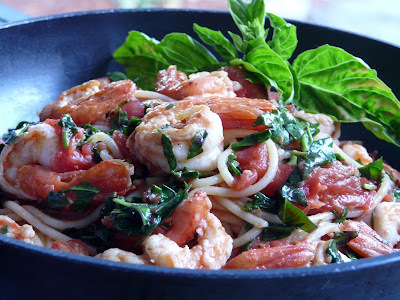 I put a pot of water on to boil for the pasta and while the spaghetti cooked I heated olive oil over high heat and quickly sauted the prawns sprinkled with hot red pepper flakes. Removed the prawns and set aside. Added a little more olive oil to the pan, two cloves of minced garlic and a small can of quality Italian tomatoes, broken up, (I used my fingers) and a splash of chicken broth. Seasoned with salt and pepper. Simmered for a few minutes while the spaghetti was still cooking. 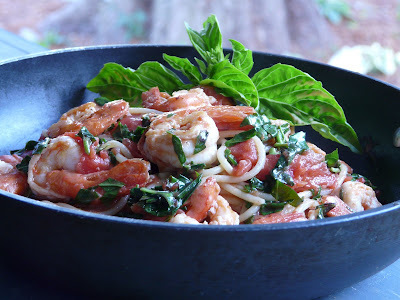 Drained the spaghetti , I tossed the prawns back into the sauce, added the spaghetti, threw in a big handful of chopped fresh basil (from my garden) tossed and served. Wow, is my mouth watering. I can practically taste the freshness. What a wonderful dish. I'm envious, seafood like that just can't be found in my part of Indiana. Oh my, oh my, oh my! This looks over the moon good! This looks wonderful! Just looking at the pictures makes my mouth water! If I cannot locate the spotted prawns I will go with whatever I can find!